People come for Craniosacral therapy because they have acute physical problems like headaches, bad backs, or long- standing problems both physical and emotional. Others come for ongoing support to meet life’s challenges. It’s a gentle yet powerful way of assisting recovery from injury, illness or stressful life situations. Because it is so gentle and non-invasive, Craniosacral Therapy is suitable for everyone from children to the elderly and those with fragile health. Mothers and babies often come for problems associated with difficult or traumatic births. 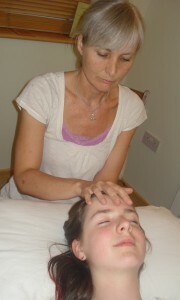 Craniosacral therapy is a gentle hands-on therapy that has developed from osteopathy but uses no force. It works deeply to release restrictions in the tissues and encourage the body’s natural capacity for self-repair. It can be beneficial for recent or old injuries and physical conditions – and can also be helpful for emotional and stress-related problems. It can be very beneficial around the effects of shock and trauma held in the body. For adults the first treatment lasts for 1 hour and begins with a conversation so that I can find out more about you and your health. Subsequent sessions last for 45 minutes. The treatment is usually carried out with you lying on a couch or seated, fully clothed. I make light contact with your feet, head, the base of your spine, and other areas, encouraging your body to relax and begin to make the changes it needs. Because the body functions as a whole, I may focus on areas other than where your symptoms occur. My hands ‘listen’ to various rhythms and movements in your body and facilitate change in areas of restriction. Each person responds differently to treatment but it’s common to feel calm and relaxed during and after a session – though at times you may feel more tired as changes take place. Feelings and memories may arise, which can be unexpected and you may become aware of sensations such as heat, tingling or pulsation as changes occur. I encourage you to tell me about any sensations as they happen. Ultimately, as the body eases, there can be a profound sense of underlying vitality and wellbeing. The number of treatments needed will vary – though it’s helpful to plan for three weekly sessions initially to allow the process to unfold. Some symptoms may resolve immediately while other, deeper patterns may take longer to release. Babies and children tend to respond quickly and may need fewer sessions. The therapy works with underlying causes as well as specific symptoms. I will discuss this with you during our first meeting and we agree a plan together, depending on your aims and reasons for treatment. after a session there is occasionally a short period of adjustment as part of the healing process, where you may become more aware of symptoms. Sometimes people report relief after only one or two sessions. For long-standing problems further sessions may be needed. Some people find they benefit from regular treatment over an extended period of time and say that, as well as noticing improvement in their physical or emotional symptoms, they feel that they have more awareness of their own body. “Comforting, a sense of relief, deep stillness and relaxation, connection, feeling accepted, feeling more fully alive, put back in one piece, feeling whole again”. The therapy has developed from osteopathy, specifically from discoveries about the body’s subtle physiology made by Dr. William Sutherland, an American Osteopath, about 100 years ago. The therapy works with various movements and rhythms within the body relating to cerebro-spinal fluid, subtle motion of the joints etc. If you’d like to have a chat about whether this therapy might be suitable for you, or to book, just give me a ring: 07981 866 667. Through Jess's skilled and very sensitive touch she was able to improve mobility and significantly reduce pain after just a couple of sessions.